I suppose if you’ve only built a few similar electric guitars, you might conclude that the wood doesn’t really matter all that much; but if you’ve built a few guitars of the same design – each with different woods- it quickly becomes apparent that different species of woods do sound different from one another. Even wood of the same species can have widely different properties as a result of different growth rates between different trees or different climate, temperature, amount of rainfall, amount of exposure to sunlight or high winds, mineral or nutrient content of the soil, etc. There are a lot of reasons one tree can vary from another harvested in a different location. When our distributor Arne at Vintage Guitar Norway asked us recently to make a Jazzmaster pickup set that would make a new Jazzmaster sound like his ‘59 Jazzmaster guitar, we took a stab at it. It’s one thing to make a pickup that sounds like an original ‘59 Jazzmaster pickup—which can be a feat in itself—but it’s another to make two different instruments sound the same. 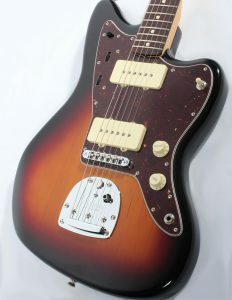 According to the folks at Fender, this Jazzmaster was one of three pre-productions guitars made for the 1959 NAMM Show. Once completely painted over with blue house paint, it has since been “restored” and now plays and sounds so sweetly. The tremolo tailpiece on this particular Jazzmaster is made of a little bit thicker stock than most of its time or since. One thing that really makes this guitar special is the alder body, which is noticeably lighter weight than what is typically available now. It also has the thicker rosewood slab fingerboard used in the ’50s; and the tremolo tailpiece, if I recall correctly, is made of a thicker material than what was used later. Combine that with the anodized pickguard, which has an effect of warming the sound, and you get a really sweet tone you don’t get with the heavier, denser, harder alder typically used nowadays. Sound travels at different rates through harder and softer materials. “But wait,” you say. “What does wood have to do with magnetic pickups? 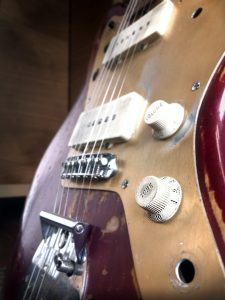 Magnetic pickups only work when certain metals vibrate within the magnetic field.” That’s mostly true; but you can talk into a pickup with a loose coil and hear your voice – but there is something else going on that some people miss… Imagine if it were possible to use a piece of foam rubber for the guitar body. It’s not too hard to extrapolate that the sustain of the string would be almost non-existent because the foam would absorb the energy of the strings’ vibration. The material used for the body affects how the string vibrates or can affect if the high frequency vibration, lows or mids could be dampened or reflected back into the string motion. Certain string overtones can be enhanced or diminished. The initial attack can be affected: quick and punchy or slower and smoother, the sustain of the string will be affected too. The guitar itself shapes the content and envelope of the string, which is then picked up by the magnetic pickup. Here’s a simple example: put brass saddles on your Tele, play it, and then put steel saddles on it and compare. That has nothing to do with how the pickup works, but the change in saddle material changes the content of the string vibrations: steel saddles maintain more treble in the string vibration, titanium even more—brass saddles will reduce some of the treble and give a warmer tone. Many variables are combined that result in overall tone of the guitar assembly; string gauge and composition, scale length, pickup placement, woods used, fret wire type and size, potentiometer value, the particular way the guitar is wired and of course the amp used and individual player. Enter the Fender Classic Player we purchased to make a pickup set that will transform it into a ‘59 per Arne’s request. What’s different between the two guitars? 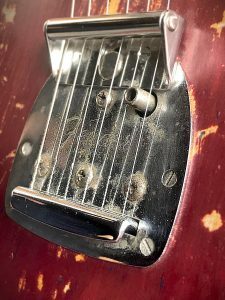 Well, on the Classic Player, the bridge is direct-mounted like a Les Paul rather than the original that slides down into steel ferrules that are pressed into the body. The weight of the body wood is certainly heavier, and it has a plastic pickguard. And there’s the other factor: the bridge. When you couple the strings to the body in a more direct way, it’s going to transfer energy from the strings more efficiently. It’s probably going to be snappier with more pronounced transients and treble—and that’s just the bridge! It’s going to be subtle, but it’s just one of a number of factors affecting the outcome. After installing exact copies of the pickups in my ‘59 into the Classic Player model, the result was a brighter brassier tone. So, we started winding pickups using different materials based on our previous experience. Normally, we are trying to make a pickup that sounds like the original and we try to eliminate the variable of different guitars. In this case, we were doing the opposite: trying to make the pickup sound like it was installed in an old guitar. 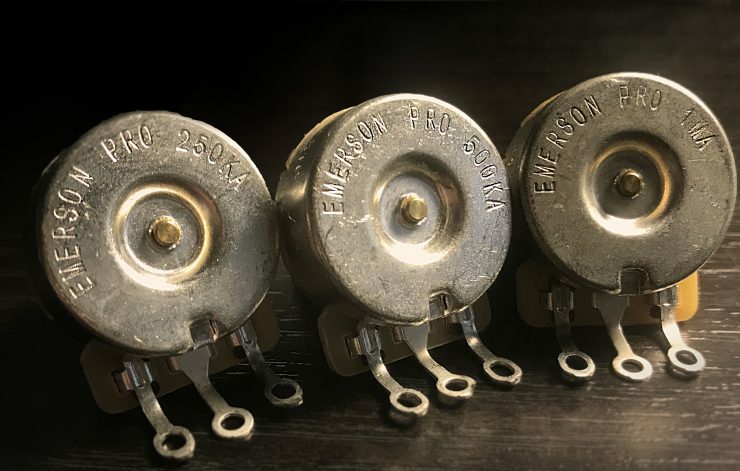 We started with alnico 2 rods, which will typically give you a smoother attack with more bottom and poly nylon wire for a neutral effect, wound to the typical Jazzmaster turn count—which isn’t much different from a Strat, but because the coil is so low and wide they read much higher when you measure the ohms. Jazzmasters are typically 8.2K +/– whereas a Strat would be about 6.2K wound to the same turn count. The actual voltage generated is similar between the two but the frequency response on the Jazzmaster has more bass so the extra bass can make it seem like the Jazzmaster is a hotter pickup. The results of alnico 2 with poly coil wire and a typical turn count: too bright. The bottom end was almost in the ballpark but not close enough. We needed to darken this up and get more bass but it needed to be tighter. I’ve found enamel wire, in many applications, will give slightly more of the fundamental tone of the string with fewer high overtones; a subtle change, but it will often do the trick. But in this case, we found it was even brighter than poly. Next, we switched over to alnico 5 rods to tighten up the attack on the lower strings, and going back to poly wire, but with more turns. As a result, the treble got warmer, but transparency was reduced and the bass strings became way to wooly sounding. We tried a few more combinations but were just not getting close enough. Typical pot values used for passive guitar volume and tone controls range from 250K to 1Meg. 250K and 500K are most common. Lower value pots have less resistance that lets treble frequencies bleed through the pot to ground so you loose treble with lower value pots. One thing a lot of people don’t realize is that typically there is, at best, a 10% tolerance on these parts so a 500K pot could actually be 450K, some pots even vary more up to 30%. Changes from 500K to 450K are noticeable. When we set up two guitars to compare pickups in we match the pots in both with an ohm meter and we match the caps with a capacitance meter—even the lead wire length can make a tonal change. We work with some manufacturers that will measure each individual pot, thereby tweaking the tone by selecting pots to get either a slightly brighter or darker tone. Conventional application is 250K are used for single coils and 500K are used for humbuckers but that’s just convention! Typical guitar pickups do not have anything near to a flat frequency response and neither do typical guitar amps so rolling off treble is sometimes appropriate. 250K rolls off quite a bit of treble, 500K rolls off less and improves bass punch and clarity to some extent. 1 meg often sounds unnaturally trebly, depending on the pickup and amp, but the bass tends to sound more grand piano-like. So convention should be questioned and pot values can be another tool to achieve your tonal objective. We went back to where we started with the same stock Lollar Jazzmaster pickups but swapped in 250K pots in the new Fender Classic Player Jazzmaster instead. We have spent countless hours listening to different pickups and guitars listening to almost indistinguishable differences and over the years a number of us have developed our ears to the point we can hear trivial details. 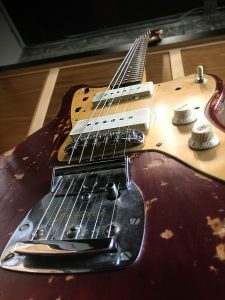 So… after all of that, it wasn’t different wire, or magnets, or any other changes to the pickup design; installing 250K pots in the Classic Player Jazzmaster with our stock Jazzmaster pickups made the Classic Player sound like my ‘59 Jazzmaster – just with the pots! After all chasing our tails over pickup design, trying to somehow make something that sounded different than what we’d already been making for years – to no avail – we discovered that our standard Jazzmaster pickup was already a winner. All it we needed to do was disregard convention and pair them with 250K pots to accommodate for the differences in the two different guitars! 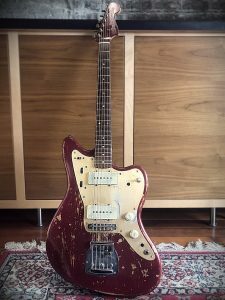 This entry was posted in Custom, Jazzmaster, Miscellaneous, Pots, Technical, Vintage and tagged Custom, Jazzmaster, pickups, potentiometers, pots, vintage by Jimmy Davis. Bookmark the permalink.